Perhaps he just wants to keep his shirt clean. 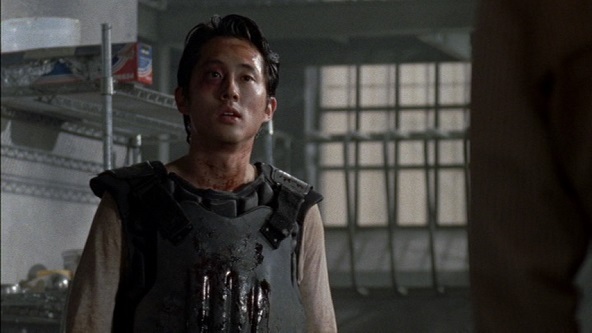 Why do the people in The Walking Dead wear body armour? I could understand heavy, metal-mesh gloves like butchers wear. Or some kind of padding or shielding for arms. Think of the way people use such protection when training attack dogs: you hold out your arm and let the dog grab hold of it. Even greaves for the lower legs would make sense when wading through a herd of crawlers. But why armour for your torso? When has a zombie ever gone for someone’s chest or back?